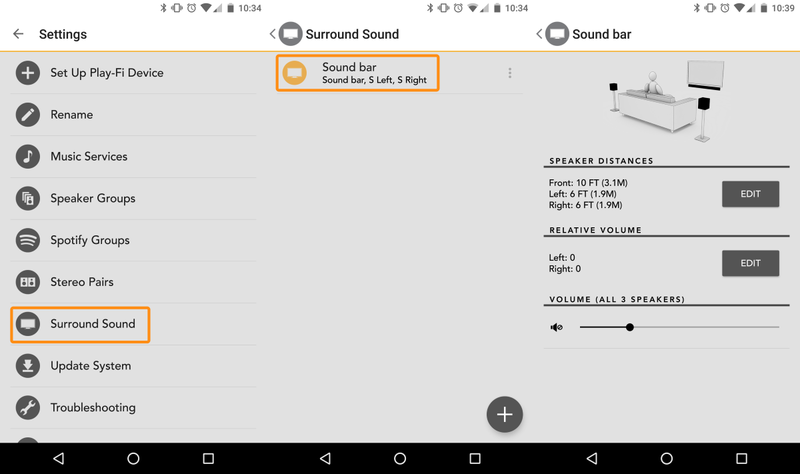 If you need to make adjustments to your Play-Fi Surround configuration in order to improve your 5.1 surround listening experience, the app can take care of it. No need to reconfigure or run through setup again. Go back to the Surround Sound option in the Settings menu, and you'll see your already-configured Play-Fi Surround group. Tapping on it will open its Edit page. At a glance, you'll be able to read the current settings for the Play-Fi Surround configuration, and you'll also be able to adjust the master audio level, which controls the audio output level of the whole group (this can also be done using the physical buttons or remote of the Play-Fi Surround Master). The Edit buttons for each section will allow you to adjust the distance settings for each product in the group and the relative volume (aka "Trim") of the Surround Left and Surround Right products. If you're playing content through the Play-Fi Surround grouping at the time, changing these settings will take place immediately and won't interrupt playback, so you'll be able to fine tune on the fly.